Pablo Beimler shares information about Ready, Set, Go! program with Waimea Middle School ʻohana. 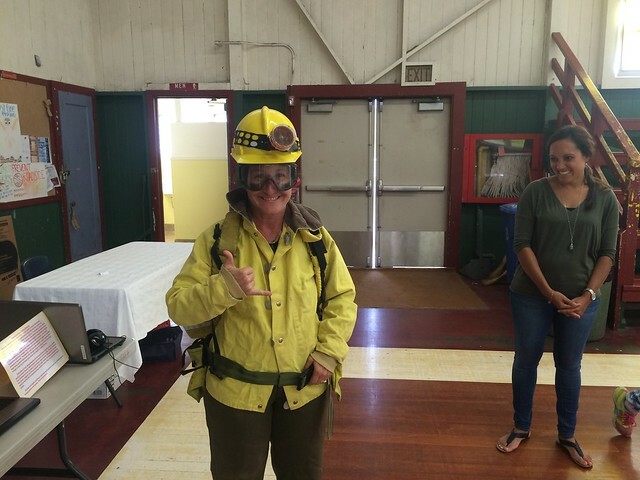 Waimea Middle School student gets dressed in wildland fire gear. HWMO joined a number of other organizations aligned with these values at the Waimea Middle School’s end-of-the-school-year event to celebrate Mālama Honua. Each organization was able to host a booth on May 18th at the WMS gymnasium and give a brief presentation to visiting ʻohana and WMS kumu. HWMO’s Pablo Beimler shared about the new Wildfire & Drought Look Out! campaign and background on the Ready, Set, Go! program. Students and their families stopped by the HWMO booth to learn more about wildfire readiness and take home free giveaways and Ready, Set, Go! Action Guides. Pablo even worked to spark some of the students’ memories by quizzing them on the components of the fire triangle (and all of them remembered from their classes with Pablo a couple months ago!) Teachers and students also took part in the Wildland Firefighter Photo Shoot, dressing up in wildland fire gear and taking home a Polaroid to post on their fridge. Fire prevention signs made by students at Waimea Middle School. During the wildfire lessons a few months ago that Pablo held at the school, students were asked to make fire prevention posters as part of a mock social media campaign. Some of the incredible posters were displayed for all to see at the event, which was definitely a highlight for HWMO to see! Mahalo to Waimea Middle School for such a great partnership this school year.